The braking distance for vehicle equipped with an anti-lock braking system (or Electronic Stability Control) may be longer than for those without it in the following road conditions. The ABS warning light will stay on for approximately 3 seconds after the ignition switch is ON. During that time, the ABS will go through selfdiagnosis and the light will go off if everything is normal. If the light stays on, you may have a problem with your ABS. We recommend that you contact an authorized Kia dealer. 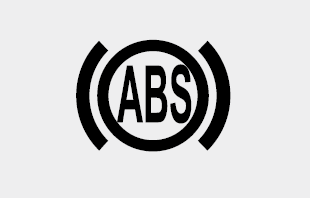 When you drive on a road having poor traction, such as an icy road, and operate your brakes continuously, the ABS will be active continuously and the ABS warning light may illuminate. Pull your vehicle over to a safe place and stop the engine. Restart the engine. If the ABS warning light is off, then your ABS system is normal. Otherwise, you may have a problem with the ABS.We recommend that you contact an authorized Kia dealer.